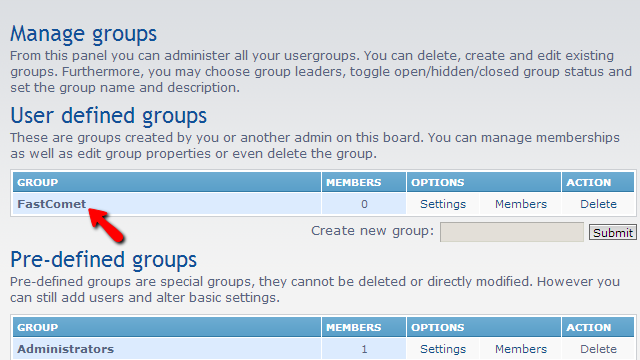 phpBB allows you to easily create, delete or edit user groups via the Administration Control Panel of your platform with few clicks. 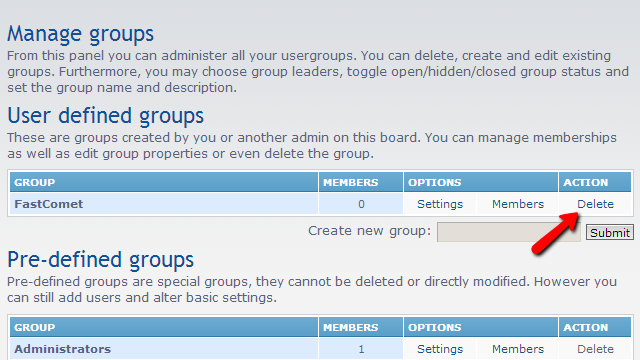 The reason why you would like to manage different groups of users is that you can more easily set permissions for those groups or manage the access of the concrete group of users to the features of your Board. First lest begin by logging into your Administration Control Panel. 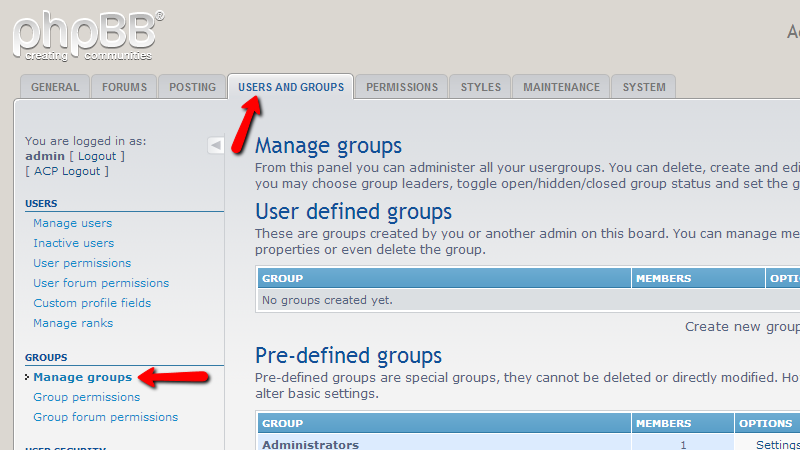 Once loged you should navigate to Users and Groups>Manage Groups. 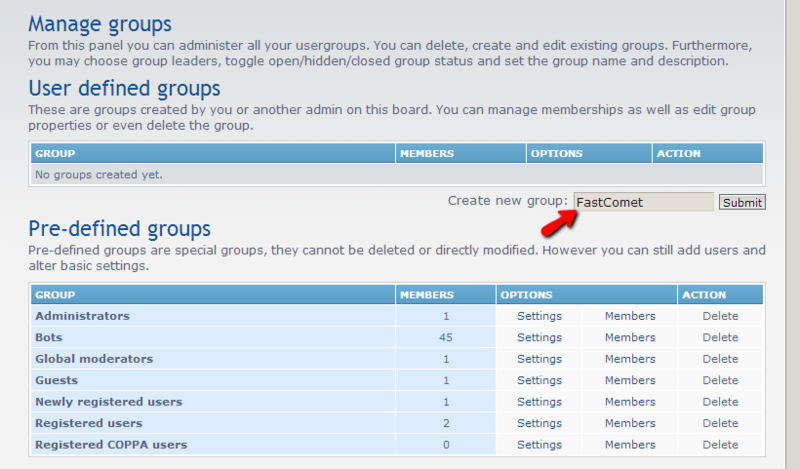 This link will redirect you to the Groups Management page where the actual group management occurs. 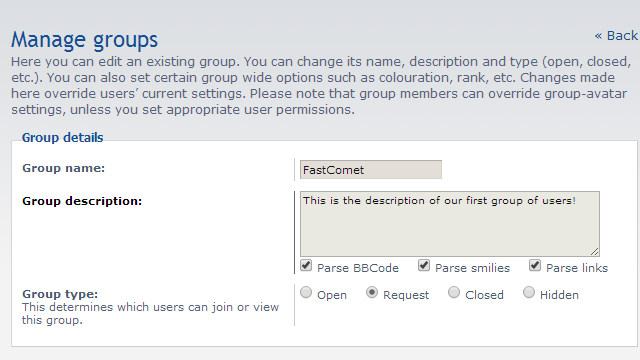 In order to create a new group you should simply enter the group‘s name in the Create new group field and ht the Submit button. This will redirect you to a new page where you will be presented with all of the fields you will need to set for your new group. These fields are quite self-explanatory and for this reason we will comment only the first section of fields called Group details. Once you are ready with filling all the information you would like to for your new group please scroll down and click the Submit button located at the bottom of the page so the information can be saved. 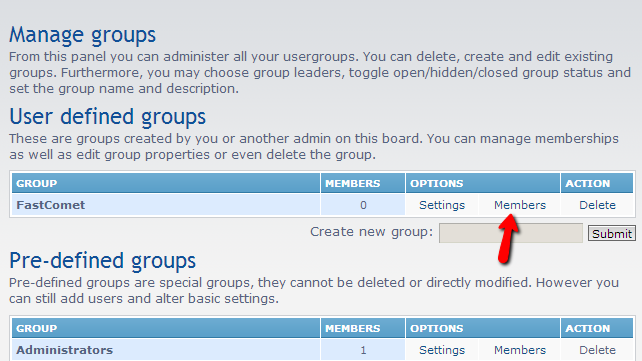 Now that you have your new group created you will be able to see the group under the User defined groups section of the Manage groups page. If you would like to delete the created group please use the Delete link under the“Action column of the tables view with your groups. 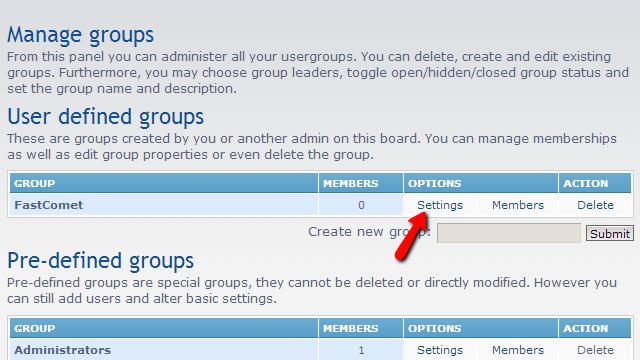 The final step in this tutorial is for editing the settings for already existing groups. This can be easily achieved from the Settings button under the Options column of the groups table view. Once clicked this link will lead you to basically the same page with settings you have used when you were creating the group and all of the settings on the page will be the same. This link will lead you to the home page for the members of this group. There you will be able to see the existing members into the group under the Group members section or to add a new user to the group from the Add User section. That is all you will need in order to manage the groups on your Board!